At Summer Dental, our smile makeover patients often ask for several (or all) procedures in one visit. It all depends on the specific treatments needed to achieve your perfect smile. We develop a unique treatment plan for each patient after an extensive consultation and examination. 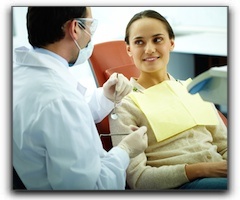 Many cosmetic dental patients benefit from sleep dentistry. Conscious sedation is especially useful for procedures such as multiple wisdom teeth extractions and dental implant placement. We know that cosmetic dentistry is a substantial investment for most Las Vegas dental patients. Some services are covered by dental plans, so if you have dental insurance, be sure to find out exactly what is covered. Many residents use flex spending accounts for dental work and reap the tax advantages. With the latest materials and cosmetic dental techniques, healing times are often minimal. However, some procedures such as bone grafting, soft tissue grafting, root canals, and dental implants often require a short healing period. Consider how the timing of your dental visits and the required healing periods will affect your job and family responsibilities. At Summer Dental in Las Vegas we provide cosmetic dentistry, as well as pediatric dentistry and other services. Schedule an appointment today.